Both of my guilds make donation quilts from 12" blocks. The quilts are given to many organizations. Last Christmas some went to families at a local school district, Rural Services and several other groups. When it was my turn to provide the BOM for Piecemakers, the Red and White Quilt Exhibit has recently closed in New York City. I thought we should make a red and white quilt in honor of that show. I chose Double Square. Co-President Nancy asked for more red and white blocks so we could have several of those quilts to give away. This is my second block. This morning I found a fabric with 1" red hearts. That will be the red for my third block. Triangle Guild, in honor of the 4th of July, chose a red, white and blue Calico Puzzle. The red in this block is in the center square, red stars. This was Lorane's choice for the Piecemakers' July BOM, Greek Cross with Flower. I had just a bit of the pansy fabric for the center and a pale yellow with green and a bit of lavender for the inner bars. I think I used the pansy fabric in Becki's bridal shower quilt. I'm sitting here looking at a Disappearing 4 Patch that looked strange to me. Had to get a ruler to measure. I made a cut 1/4" wider on one piece. It's 8" square and will make a good large potholder. Some of my potholders look a bit shabby so it will make a great replacement. The kitchen witch won't care if it is off kilter. We always hang a potholder on the dishwasher so we know the dishes are dirty. I was having a lot of trouble with the dishwasher. The glasses and cups were not sparkly clean. They had detergent residue on the outsides. I was at Lowes the other day and asked the front end gals if they had something to clean a dishwasher. One sent me back to appliances and told me the product would be there. I bought Dishwasher Magic for $4.17. I ran a cycle in the empty dishwasher and then washed a load of dishes. Wonderful. Our water is hard. Coffee pot demands a cleaning about once a month. This Hamilton Beach sends out a beep that is very annoying. I was searching the kitchen to see where the noise came from. Saw the flashing signal and sound. Promptly unplugged it and got out the white vinegar. Presto. A happy coffee pot. The Campfire Girls celebrate Ella Mae's 70th birthday. There were lots of cousins to play with when we went visiting or they came to our house. This is Ella Mae. She was the second child of Uncle John (Jack) and Aunt Mary Gaylord. Her older brother Charles (Chuck, Charlie) lives in Okolona, Arkansas now. She lives close by on a hill out of Chenango Forks with her husband, two elderly horses and two dogs. Ella Mae gardens, is a birdwatcher and quilter. She has been involved with a program at her church making Little Dresses for Little Ladies for girls in Haiti. Dad was the youngest of four children. His oldest brother Uncle Harry and Aunt Velma (Wade) had one daughter Marjorie who passed away in 2002. Marjorie was married to Bob Loftus. Aunt Orrilla and Uncle Percy Birchard had one daughter Ruth who married Dwayne Shearer. Ruth died in 2003 and Dwayne in 1996. On my Mom's side of the family I was the oldest of twenty grandchildren. Some of them are younger than my children. I remember some of the cousins visiting at the farm and Bruce (my brother and a general pest) took Bobbie for a ride down Sap Bush Road and Cloverdale Road. By the time they got back home Dad had received a phone call from an irate neighbor on Cloverdale Road. Seems Bruce was driving at a speed the neighbor considered fast. Bobbie has found lots of pictures of all of us when we were young. Such fun to look at. Bobbie writes a family newsletter for us and includes her latest photo finds. Now to do the frog stitch on a Churn Dash block. After it was nearly complete, I discovered I had sewn in the center square wrong side too. Ripit ripit ripit. 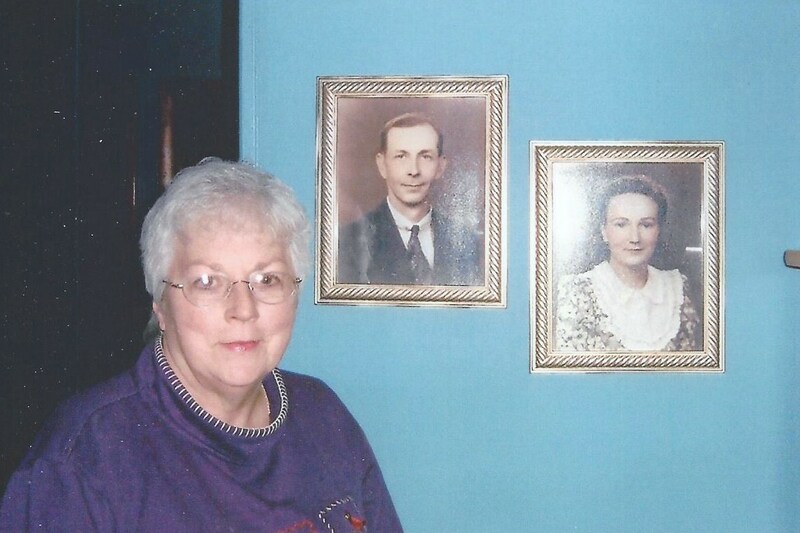 These pictures of Dad and Mom on Mickey and Eric's living room wall were taken in the Summer of 1943. That was the summer before I started school at Chenango Forks. Miss Ginsberg was my first grade teacher. I wrote with my left hand and with my right hand. She told me to use the hand which was easiest. So I'm a lefty. The next year Charlotte Kenyon was my teacher. She just mumbled under her breath and allowed me to write with my left hand. My friend Bertha Leonard wasn't so lucky. The other second grade teacher Mrs. Kinney made her switch to using her right hand. Second grade opened up the wonderful world of reading to me. Thank you, Mrs. Kenyon. Mrs. Kenyon had two rows of second graders and the rest of the large room was third grade. It was interesting to hear her scold a boy in third grade because he declared he would have no use for arithmetic after he left school. He told her he would become a ditch digger. She stopped him in his tracks by asking "How will you know how much money you will make if you can't do sums?" It was fun to listen to the third graders' recite. I think I learned a lot from being in that room. Mrs. Kenyon was also my third grade teacher. We didn't have any second graders with us that year. In fourth grade Mrs. Sparks was the teacher. We loved recess that spring. We went down to the far end of the playground and picked violets in the small trees along the riverbank. Then when the weather got warmer we decided to wade in the river. That came to a screeching stop when an older girl who had been held back several times pushed Bert and me in the river. We went back to class wet to the waist. After that we were strictly forbidden to go to that end of the playground. I remember the other students pointing at the water puddles on the floor under us that day. They had the nerve to insinuate that we wet our pants. I hurried off the bus that afternoon, changed out of my school dress and shoved it in the bottom of the hamper so Mom wouldn't see it. She never knew about this until I was an adult. Mrs. Sparks became the librarian at the Mary Wilcox Library in Whitney Point after she retired. She later moved to Connecticut with her son and started oil painting. A schoolhouse scene hung in the library. It was of her first school, King Street School in Barker.